What’s better than anime girls? Anime maids! Japanime Games has you covered with the deck building card game Tanto Cuore! While we were at Anime North this year a friend of mine introduced me to Japanime’s products and it really stuck with me. Thankfully those folks were nice enough to set us up with some materials so we can check out the game and share some brand new videos with you! As I’m sure you know, we’re relatively new to promoting physical game media like this. It is something we’re passionate about however and we’re happy to finally be bringing content like this to you. 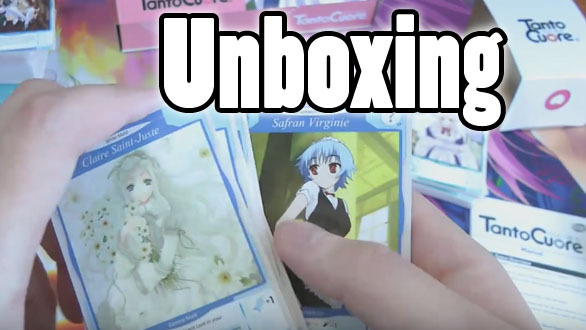 The video below features yours truly opening up the core box set of Tanto Cuore. That doesn’t mean there are booster packs. Instead, everything to play the game is included in the main box. There are expansions to the game, but those come in their own full box sets. We also have a more tactical board game from Japanime Games to check out as well. So stay tuned for that as well as my coverage of actually playing Tanto Cuore! I was surprised to see such a reaction from many of my friends in Toronto. They love the game to pieces so I’m certainly eager to dive in and see what we can do. If all goes well we may even be lucky enough to have some celebrities from our animation joining in for the video!